(Nanowerk News) A space rock several hundred metres across is heading towards our planet and the last-ditch attempt to avert a disaster – an untested mission to deflect it – fails. This fictional scene of films and novels could well be a reality one day. But what can space agencies do to ensure it works? ESA is appealing for research ideas to help guide the development of a US–European asteroid deflection mission now under study. 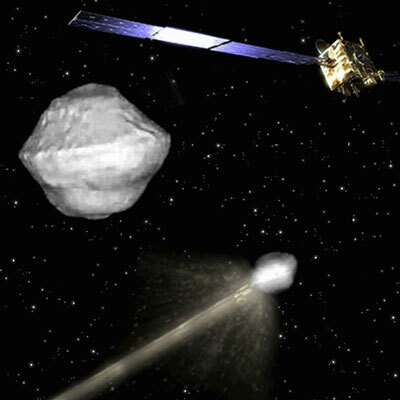 The US-European Asteroid Impact and Deflection mission – AIDA. This innovative but low-budget transatlantic partnership involves the joint operations of two small spacecraft sent to intercept a binary asteroid. The first Double Asteroid Redirection Test (DART) spacecraft, designed by the US Johns Hopkins Applied Physics Laboratory will collide with the smaller of the two asteroids. Meanwhile, ESA’s Asteroid Impact Monitor (AIM) craft will survey these bodies in detail, before and after the collision. The impact should change the pace at which the objects spin around each other, observable from Earth. But AIM’s close-up view will ‘ground-truth’ such observations. Concepts are being sought for both ground- and space-based investigations, seeking improved understanding of the physics of very high-speed collisions involving both man-made and natural objects in space. ESA’s call will help to guide future studies linked to the Asteroid Impact and Deflection mission – AIDA. This innovative but low-budget transatlantic partnership involves the joint operations of two small spacecraft sent to intercept a binary asteroid. The first Double Asteroid Redirection Test (DART) spacecraft, designed by the US Johns Hopkins Applied Physics Laboratory will collide with the smaller of the two asteroids. Meanwhile, ESA’s Asteroid Impact Monitor (AIM) craft will survey these bodies in detail, before and after the collision. The impact should change the pace at which the objects spin around each other, observable from Earth. But AIM’s close-up view will ‘ground-truth’ such observations. But by working in tandem, the quality and quantity of results will increase greatly, explains Andrés Gálvez, ESA AIDA study manager: “Both missions become better when put together – getting much more out of the overall investment.